Prof. Boaz Ganor, Founder & Executive Director of ICT, presented dilemmas in achieving international cooperation in the CTC Conference of India Foundation, India. During the conference Prof. Boaz Ganor met with former MK Avi Dichter, Chairman, Foreign Affairs and Defense Committee, Knesset, Former Minister of Public Security & Home Front Defense & Former Director of the ISA, Israel. Dr. Eitan Azani, Deputy Executive Director at the International Institute for Counter-Terrorism (ICT) and Head of the BA & MA Specialization in Counter-Terrorism at IDC Herzliya, met with Lord Mendelsohn and briefed him on "The situation in the region concerning Hezbollah, Iran, Syria and Iraq"
The Prague Centre for Transatlantic Relations of the CEVRO Institute (PCTR) in cooperation with the LEX – the Czech Gun Rights Protection Association, held an international conference titled: “Czech Republic as a Central European “Texas”?” on March 23, 2017. The conference was opened and moderated by the PCTR Director Alexandr Vondra. The first panel was dedicated mainly to the current proposal to amend the Czech Constitution to include the right to possess a gun. Then in the second panel three international speakers presented how the gun ownership is handled in their countries. Brig. Gen. (Ret) Shaike Horowitz, Associate at ICT, presented the situation in Israel. Mr. Jonathan Davis, Vice-President for External Relations at IDC together with Mr. Stevie Weinberg Director of Operations at ICT and Lt. Col. (Res.) Uri Ben Yaakov, ICT Senior Researcher hosted a delegation of the British Labor Party, headed by the Secretary General, Ian McNicol. The delegation was briefed on recent regional events and the civilian home front dealing with terror attacks. Col.(Ret.) Jonathan Fighel, Senior Researcher & Head of the Terrorism Prosecution Desk, International Institute for Counter-Terrorism (ICT), Interdisciplinary Center (IDC), Herzliya participated in The Istanbul Security Conference that was organized by Kaskent University in Ankara and Konrad Adenauer Foundation in Turkey under the title “Boundless Crisis, Integrity and Security”. Col.(Ret.) 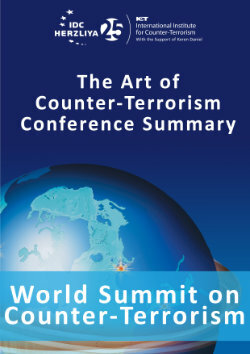 Jonathan Fighel was the commentator in a panel "Is Europe’s Approach for Defense against Terrorism Working?" He also lectured on “The Rise of Extremism in the Global Arena”. Lt. Col. (Res.) Adv. Uri Ben Yaakov presented "The Terrorist Organizations' use of Drugs and Pharmaceuticals with the emphasis on Hezbollah manufacturing and distribution of Captagon" in a conference which dealt with the connection between Crime and Terror in Hague, that was organized by the Netherland's Foreign Affairs Ministry. Op-Israel is the name given to a campaign of cyber-attacks carried out by hackers identified with the international anarchic group ‘Anonymous’, and with pro-Palestinian hacker groups, against Israeli Internet sites with the goal “to disconnect Israel from the cyber world”. The first Op-Israel campaign was carried out during Operation “Pillar of Defense” on the eve of Holocaust Remembrance Day on April 7, 2013. Since that operation, the campaign became a tradition and every year on this date an organized cyber-attack is launched against Israeli Web sites. The Op-Israel campaign includes a variety of attacks, including “crashing” Web sites and preventing them from providing services, hacking databases and leaking information, and taking control of Web site interfaces and defacing pages. The attacks are directed against government Web sites, financial institutions (banks, insurance companies), public Web sites as well as commercial and private sites with a relatively low level of protection. In my previous post, I argued that it is of major interest to know if the murderous chemical Syrian air attack in the town of Khan Sheikhoun in Iblib province has been approved or coordinated with the Russian air-force active in Syria. The Russian position at the future deliberations at the United Nations concerning this grave incident could also give an indication on its political standing in the affair.